In an office setting the word paperwork often conjures up images of long hours, tedious tasks, and unproductive assignments. Even important and necessary paperwork can feel mundane, draining, and inspire all kinds of procrastination. MangoApps Online Forms aim to change all of that. We know that within a business some forms are unavoidable, but that doesn’t mean they should be difficult, time-consuming, or filled out in triplicate. MangoApps Online Forms allow organization and employees to quickly find, file and fill out digital paperwork, revitalizing your organization and giving employee more time to focus on engaging and productive activities. Online forms make life easier for management too. All sensitive and important information is kept safe and secure, while still allowing employers to conveniently view, analyze and interpret data. Here are 6 of the best ways MangoApps Online Forms can improve and simplify company paperwork experiences. MangoApps Online Forms allows users to easily convert their paper and digital forms into a centralized, safe and easy to navigate area. Online forms collect, store, analyze and share data all without ever leaving MangoApps, improving security and increasing collaboration. Keeping important documents and forms easily available helps teams from every department quickly access appropriate data without having to rely on an additional platform. MangoApps also allows admins to delegate user accessibility, locking forms with sensitive content from unapproved individuals. MangoApps Online Forms improves safety from external influences as well. The more information is shared and spread across multiple software and services, the greater its potential risk. By keeping information securely stored within a single, well-protected platform, organizations and employees ensure increased levels of safety and protection. Within every department, there are every day, expected and reoccurring reports, procedures, and requests. And while processing a single help ticket, follow-up survey, or vacation plan might not take much time, dozens and dozens of similar requests from employees across the organization can quickly build into a major workload. MangoApps Online Forms helps departments simplify company paperwork by automating, digitizing and streamlining some of these small but important processes, making them quicker, easier, and more manageable. Streamlining simple tasks also frees up department workers to focus on more important and creative endeavors, giving organizations a unique advantage as their employees are able to work harder, collaborate together, improve productivity and develop innovative solutions. MangoApps Online Forms simplify company paperwork by incorporating detailed and reliable trackers. These trackers help admins and assigned leaders process, analyze and store important information. Whenever a new form is submitted, designated users and admins receive the recorded responses and helpful identification information in a well-crafted, easy to analyze spreadsheet. These trackers are carefully designed to help users make the most out of new results and existing information. Once generated, trackers become highly searchable information databases, letting users find exactly what they need. Trackers also provide users with the necessary tools to analyze and understand information effectively. Users can modify, import/export, filter, arrange, share or embed tracker data however they need. MangoApps provides users with several form templates and predefined fields, helping to simplify company paperwork and making it quick and easy to generate forms for every need. Existing templates include sales leads, feature requests, vacation requests, expense submissions, and other department forms frequently used across businesses and organizations. Users can also create custom forms and edit existing templates to change, add, or remove existing fields. Customizable fields come with all kinds of options including text or rich text, numbers, drop-downs, checkboxes, radio option buttons, date, price, section breaks, file attachments, or a pre-populated look ahead list. Whatever your form is for, MangoApps can help you craft the perfect fit. With easy to make forms available at any time, businesses no longer need to keep physical master copies an can easily update, change or edit form details. MangoApps not only makes form creation and data analysis easy but also keeps filling out and recording information a simple and stress-free experience. 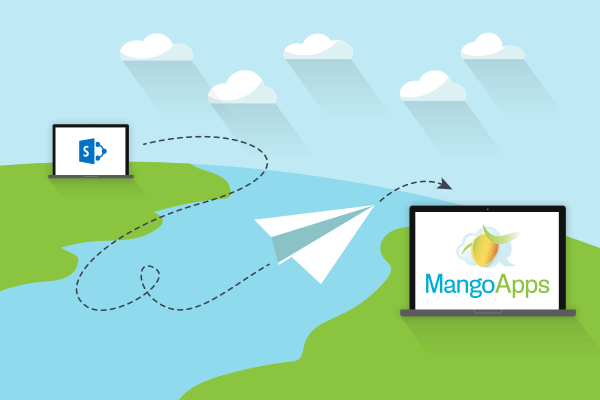 MangoApps Online Forms allow admins to embed code or share a link with external sources, allowing anyone to contribute information. MangoApps forms can also be embedded onto a company site or widget, shared within a post, newsletter or website, or even posted to social media. Forms can be designed with helpful tips and instructions around specific fields, clarifying questions and making the process easy and effortless. Once the form has been completed, users can be automatically redirected to another page, a custom message, or even the same form for multiple submissions. MangoApps Online Forms are designed for improved user experience and easy processing and analysis. Forms can be created, edited and completed on desktops, laptops, tablets, and smartphones, giving admins and employees the flexibility and freedom they need. Making forms easy to access removes the burden of finding, printing, and returning paper forms and greatly improves engagement and completion levels among employees. Businesses will always need forms to run effectively, but they don’t have to be a burden. 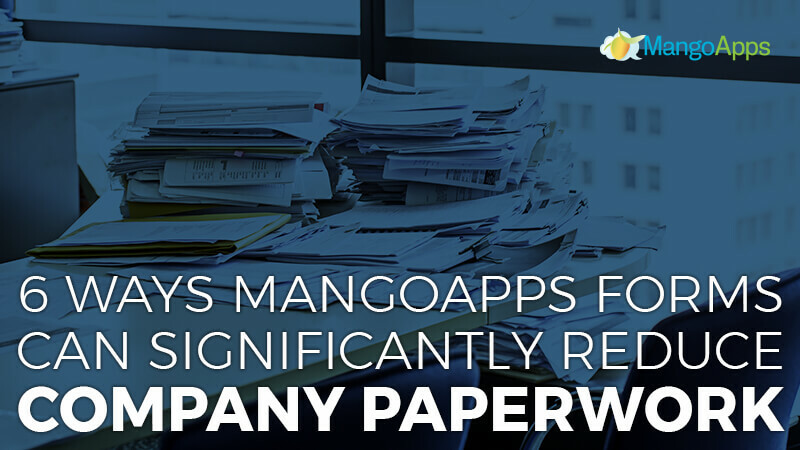 MangoApps helps companies simplify and streamline forms, providing important information without waiting periods, missing documents, headaches, or irritations. To learn more about how MangoApps Online Forms can simplify company paperwork,or our innovative collaboration software, schedule a personalized demo with us today.